The reed is our tallest herbaceous plant, if we do not include climbing plants or lianas, and the mightiest grass (Poaceae) species. Thickets of two-three metre high reeds are quite common in good habitats. The leaves and stems are already changing to straw yellow and of course the proud panicle looks splendid. 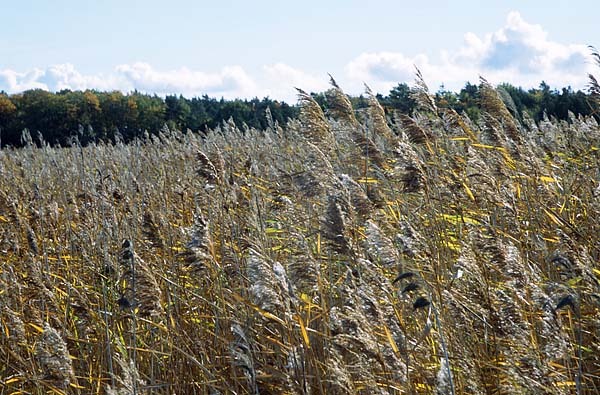 In the recent warm summers the seeds of the reed have even ripened in the panicle. The plant spreads most efficiently by vegetative means. On the ground a long, up to several metres long and a few centimetres thick rhizome grows. It sends out roots at nodes and a new above-ground shoot rises from there – a successful propagation mode the results of which we can see at the banks of many water bodies. 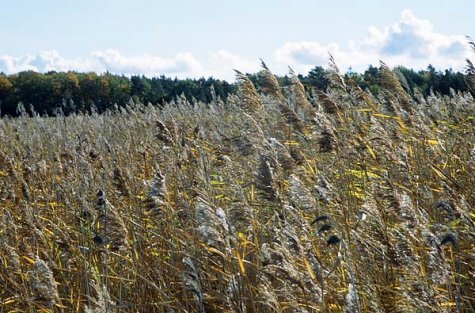 In good locations reeds can spread out as nearly the only plant and fill areas as far as "eyes can see“. Our largest reed beds are in the Matsalu Bay. Already from the second half of summer the reed beds are good and secure overnight places for passing passerine migrant flocks.